As a child of the 1970’s and 1980’s, I fondly remember sitting in my parents’ bedroom playing with my Dad’s Omega Speedmaster, starting, stopping and resetting the chronograph over and over again, for hours. I was also fascinated with all things related to space and our space program. I was astonished when my Dad told me that his Speedmaster is the same watch that the Apollo astronauts wore on the Moon. In my innocence, I literally thought that my Dad’s Speedmaster was THE WATCH that they wore. So with that, began my interest in watches that will eventually lead to this becoming a passionate hobby. Watches are tools that I use to tell time on, even in this modern era where time is everywhere, from your smartphone to your kitchen appliances. However watches are more than that – they have become part of my personal journey, with several of my watches being tied to significant life moments, personal and professional successes and achievements. In 2004, I began thinking about getting my first nice watch. Going back to my Dad’s Omega, and that he was a fan of the James Bond films, I looked no further than the Omega Seamaster as my first Swiss watch. A year later, I married the woman of my dreams wearing my trusty Bond Seamaster. Omega Seamaster in San Juan del Sur, Nicaragua, December 2007. In 2008, two years after moving to Los Angeles, and receiving my first bonus check from a new company that was working for at the time, I promptly made my way to Feldmar Watches on Pico with the goal of buying an Omega Speedmaster. I was introduced to a very humble, knowledgeable and exceptional gentleman named Sol. He offered quite a deal on the Speedmaster, hoping to earn my business. Trying to hide my excitement and silly ear-to-ear grin, I tried to play coy but I’m sure Sol knew – I was hooked. Over the subsequent years, I modified this Speedmaster with the Omega Mitsukohi panda dial, broad arrow hands and stainless steel bezel. The birth of my son in 2010 was the most wonderful thing that has ever happened to me. I spent the better part of that year learning to become a father. No one ever knows how to be a dad, you just kind of learn along the way. Aside from being a dad to a newborn, I spent my free time, searching and scouring Ebay listings for the perfect vintage 1974 Speedmaster, a watch from my birth year and to mark this occasion. Then one beautiful Sunday afternoon, in March 2011, I found it. The watch was in pretty good condition, the best that I’ve seen yet and the seller just happened to be in Southern California too. I messaged him, we quickly came to terms, met up in-person a few days later and the rest of history. This 1974 Omega Speedmaster 145.022 is my most valued and sentimental watch. If you can’t tell already, I love the Speedmaster. The fact that it’s largely unchanged from the models worn on the Moon 50 years ago, it’s manual wind movement that’s so enjoyable to wind up, hesalite crystal that gives the dial and hands a warm feeling are just a few things that makes it so special. I’m very much looking forward to Omega’s re-release of the 321-powered Speedmaster in the coming months. In 2015, after reaching a significant career achievement, I celebrated as any watch enthusiast would – I purchased my first Rolex, a Submariner. This Sub represented much more than just a watch to me. It’s an accumulation of years of hard work, time, effort and sacrifice. It’s my career diploma, proof that I did pretty good for myself. The summer of 2016 will always be known as the summer of the Big Pilot. 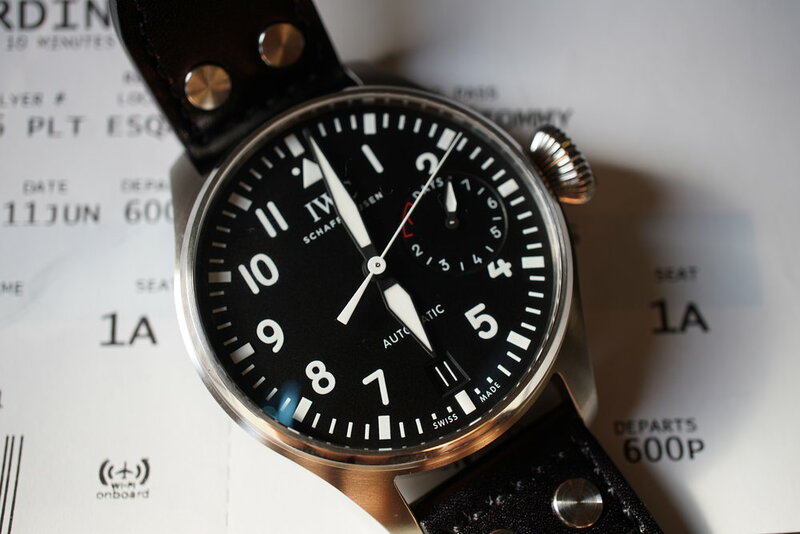 I’ve always loved the IWC Big Pilot, and after the 5009-12 was introduced in SIHH 2016 with some improvements, I knew I had to have one. So I sold several of my watches for arguably the grandest watch of them all, figuratively and physically speaking. That summer, I traveled extensively for work, flying out every Monday, coming home to LA every Friday night for weekends spent at the beach and eating out. It was a good summer, and on the wrist through every moment of that summer of 2016 was my Big Pilot. Last year, my wife and I celebrated our 13thyear anniversary for which I received the latest Omega Seamaster, the 2018 edition with the gorgeous blue ceramic dial and laser cut waves. This is the best Seamaster yet. San Juan del Sur, Nicaragua, is one of my favorite places to visit and we usually visit every couple of years. Last year I took my Seamaster on that trip, took a photo of it on the same beach, almost the same exact spot as the one with my first Seamaster from 11 years ago. Full circle. Omega Seamaster in San Juan del Sur, Nicaragua, January 2019. This was my life for the past 15 years and how watches and watch collecting are a part of it. Along the way, I’ve met some very good people, like Sol, Scott and the extended Feldmar family, fellow watch collectors on Instagram and became a member of LA Watch Gang (@lawatchgang), a local watch enthusiast/collector group in Los Angeles. LA Watch Gang celebrating its 5thAnniversary, February 2019. Cake by my wife, @l_oeuvre. One of my favorite movie quotes is from Sir Patrick Stewart, as Captain Jean-Luc Picard saying, “I rather believe that time is a companion who goes with us on the journey and reminds us to cherish every moment because they'll never come again. What we leave behind is not as important as how we've lived.” This is what watches are – time keeping companions that accompany us on our life journey and reminds us to live for the moment as it only comes once.